***From the archives: This is one of my all-time favorite interviews! Resembling the lovechild of H.H. Holmes and a silent era siren, when it comes to dark music there is only one Jill Tracy. As a singer, pianist, and performer, she conjures a timeless netherworld that opens up the portals to forgotten places; nightmarish, magickal, bathed in perpetual twilight. It is not surprising that since her breakthrough album, sophomore effort 1999’s Diabolical Streak (a follow-up to 1996’s Quintessentially Unreal)—which includes morbid classics like Evil Night Together, The Fine Art of Poisoning, and Pulling Your Insides Out—Tracy has gone from strength to strength, gathering worldwide acclaim. Constantly evolving, tirelessly, endlessly, she is a creative force to be reckoned with. Diabolique caught up with Tracy to talk to her about her origins, her love for the occult, the macabre, her fascination with the otherworldly, and how this fuels her creative canvass. Tracy also shares with us her inspirations, her thoughts on the commodification of music and struggle with being a truly unique independent artist, as well as discussing some of her collaborations and current work with Philadelphia’s Mütter Museum. Diabolique: How did you start out, and how has your music evolved over time? Tracy: Strangely, I have come full circle, enamoured with minimalism, and doing solo shows again. That’s how it began, me at a piano—but when I first started out, I felt like it was not enough—I wanted a band. It had to be big! Most of my songs do have a heaviness- a cinematic, dark vibe, and I thought the only way I could achieve this intensity was to have more instruments. (Little did I know.) So the band grew from 3 players up to 11! I affectionately called them “The Malcontent Orchestra.” I’d joke onstage that “in a band of Malcontents you never knew who would show up,” so we had this great revolving cast of rock star guests. Even if the band was only 4 people, we’d call it The Malcontent Orchestra. It was fabulous. But in time, became overwhelming and limiting, not only for me—but rehearsals, travels, schedules, being able to make money. I was producing events, winning awards, but I was miserable. I felt like I had lost myself (and the music) in the din. All the nuances I strive so hard to achieve in my voice and piano were buried. I realized how much I wanted to utilize space and breath between the notes. Textures. The quiet can be rapturous, the most intense thing in the entire arrangement. The soul lives in the silence. In the past few years, I have been excavating my work down to its essence, to what truly serves the songs, performing often as a trio, duo—or me alone—sharing eerie tales, memoir, scores and songs, manifesting my elegant netherworld. Falling in love with the experience that got me writing music in the first place. Diabolique: How did you discover your love of the piano? Tracy: I never wanted to play the piano. I always wanted to sing, but the piano discovered me in a sense. I was a misfit child, felt out-of-sorts with this world (still do.) I always believed there was another place, a magic, hidden realm that one could discover with the proper methods. I tried to build a time machine in my bedroom closet. I thought one could travel through the shadows. I read about time travel, the belief in other dimensions, spirits, ghosts—I would lecture to my stuffed animals about the solar system and constellations. All I wanted to do was to discover or manifest hidden worlds. I knew they existed. My mission was to figure out how to find them. I began making frequent visits to an elderly widow who lived next door. Her home was encrusted with bric-a-brac, old photos and dolls—porcelain-painted Siamese cats with jewels for eyes. In the basement was an ancient upright piano, covered entirely in beige and gold-flecked paint. It sat next to the washer and dryer, under buzzing fluorescent lights. I didn’t know what I was doing– but didn’t want to do anything else. This became my portal—and still is. Jill Tracy after-dark with 139 human skulls in the Hyrtl Skull Collection, Mütter Museum, Philadelphia. Diabolique: You’ve become synonymous with your elegant, dark style and sound. When did you discover it? Tracy: Thank you. I love that I am synonymous with my style, which essentially is just ME. I’ve looked like this for years! (laughs) I wouldn’t know any other way. I’ve always been drawn to the shadowy intrigue of the silent screen era, gypsies and fortune tellers, the occult, and 1970s rock. My style is a collection of passions. I’ve always felt any glamour worth its shimmer has an equally ragged edge. I did the proverbial running-away to New York City after high school, lived on the third floor of a former coffin factory. All I owned was a mattress on the floor and an old baby grand piano. (This was circa 1990, back when you could still be a struggling artist in NYC.) I used to sit in the wee hours at the candle-lit piano, peering through the massive floor-to-ceiling windows into the streetlights and vacant lot below. I never felt more inspired— or more alone. My music became my spell, my incantation, my catharsis. It was so private to me, in fact, that it was years before I would even let anyone hear it. Diabolique: Could you tell about some of your musical influences— also could you explain the influence of cinematic music on your overall sound? 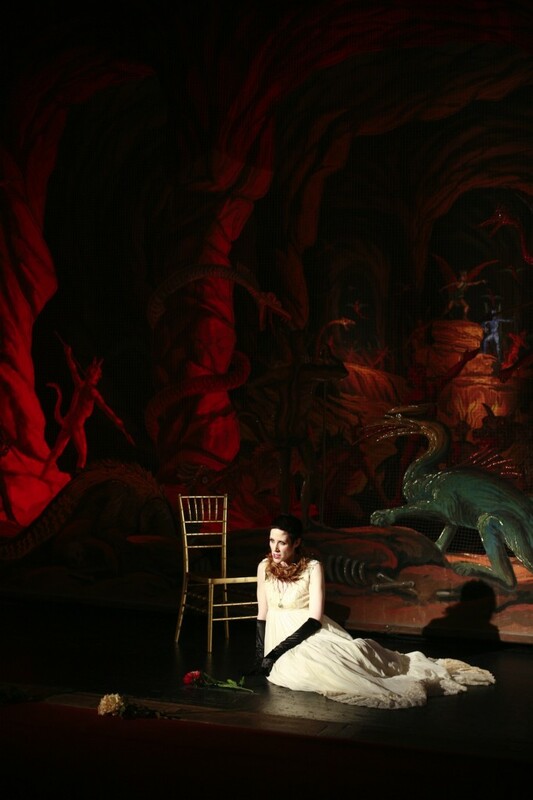 Tracy: I have always been drawn to the mysterious—fantastical, otherworldly imagery. Worlds sans-time. I’m obsessed with Alfred Hitchcock, Bernard Herrmann, Ray Bradbury, Rod Serling, Jean Cocteau. Through classic cinema, film noir, and Serling’s The Twilight Zone, I was captivated by the glorious mystery, elegance, and succinct, yet smart storytelling. Often it was what you didn’t see that really put the fear in you. Not to mention the dreamlike, sensual look to the films, dangerous romance, unsettling camera angles, surreal lighting and shadows. I used to stay up all night as a kid, watching old horror movies on Chiller Theater. I’d often turn the volume down on the TV and make up my own music. We had an old Hammond organ in the house. I learned that MUSIC conjured the emotional response. The music held all the power. What was it about certain notes or scales? Why does a certain scale make us feel scared, aroused, and then another scale or chord is joyful? Is it simply mathematics, conditioning, or something visceral? Magical? Composer Bernard Herrmann tells the tale of how Hitchcock originally wanted silence during the infamous Psycho shower scene! Can you even imagine it today without the trademark shrieking violins? That’s a vital part of what makes that scene so memorable. And those violins alone evoke fear and violence whenever we hear them. The rock bands that first inspired me had the same beautiful sense of mystique and grace—Pink Floyd, David Bowie, early Peter Gabriel, Japan, The Cure. Even listening to Led Zeppelin, Black Sabbath, early Genesis— there was something majestic—and timeless. These artists were well read, and made us want to pull books off the shelves. I learned about Aleister Crowley from listening to Bowie, learned about Nabokov from The Police. This sense of grace, mastery, and sophistication is sadly lacking today. I realized back then I wanted to create work that was timeless and singular. Diabolique: Could you explain the ideas behind your lyrical content? I often focus on the struggle of being yourself in a world that is trying its hardest to turn you into everybody else. Staying true to yourself; that’s the hardest and most glorious battle of all. Diabolique: How do you combine aspects of performance and music for your live act? What could people expect at one of your shows? Tracy: With environment and story playing such a role, I love to design events curious to the venue. I created an ongoing after-dark series at the wondrous San Francisco Conservatory of Flowers where I hosted night tours of the gardens and performed music. I curated each evening on a different intriguing theme— like the strange history of perfumes, poisonous plants and the arsenic craze, spirits that supposedly lived in various woods of violins. I spent weeks researching and exploring the abandoned (and supposedly haunted) historical buildings of The Presidio (dating back to 1776), composed music based on my findings— then presented an evening inside the Officers Club Ballroom. I worked with the historical librarian to uncover almost 100 gorgeous archival photos which I projected behind me—early 1900s abandoned psychiatric ward, morgue and hospital wards, as I revealed their tales. The best part was performing the very piece of music I composed inside, on a 1903 Steinway grand, inspired by the centuries-old legend of the lady ghost who is often seen dancing in that very space. That’s the magic music allows—like a trap door or portal, it transports us—to a place we never knew existed, but wish to go. I am a gatekeeper of emotions. My favorite thing is to be able to take an audience to that place with me. Diabolique: How does composing music in unusual locations, or via strange objects, as in your Musical Séances, differ from writing songs? Tracy: When I am writing songs, I’m emotionally connected and in charge. I’m masterful of every word, creak in my voice, arrangement, breath between the notes. It’s purposeful. There is a destination. When I channel music, it’s the complete opposite, I have to surrender. I am the conduit, a passenger. I have NO idea where I am going. That is both the thrill and the challenge. I’ve learned to compose spontaneously via various energy sources, whether found objects, environments, etc. I am clairaudient, so I often hear unexplained music and voices. The Musical Séance is a live travelling show, my long-time collaboration with violinist Paul Mercer. It’s a collective summoning driven by beloved objects the audience brings with them. Items of personal significance—such as a photo, talisman, jewelry, toy. This is a very crucial part of manifesting the music. Every object holds its story, its spirit— energy, resonance, impressions from anyone who has ever held the object, to the experiences and emotions passed through it. These compositions are delicate living things. They materialize, transport, and in the same second—they vanish. That’s the amazing thing about The Musical Seance—you never know what to expect, and each experience is entirely different, extremely emotional, for us, as well as the audience. It creates this rare synergy with everyone in the entire room. It’s the closest thing to time travel. Often, the curiosities themselves are just as compelling as the music they inspire. We’ve encountered everything from cremated cats, dentures, haunted paintings, 16th century swords, antlers, x-rays, gingerbread man, a lock of hair from a drowned boy. But one thing I’ve learned is—everyone in the world has a story to tell that will break your heart. Diabolique: So, tell us about some of your collaborators. What have been some of your most memorable moments, and favourite people to work with? Tracy: My work has attracted a very eclectic group. I’ve been fortunate to collaborate with the likes of David J (Bauhaus), Steven Severin (Siouxsie and the Banshees), UK silent film composer Stephen Horne, thereminist Armen Ra, Film Noir Foundation, SF Silent Film Festival, experimental filmmaker Bill Domonkos, Jello Biafra, Death Salon, Atlas Obscura, photographer Evi Numen (Mütter Museum,) filmmaker Jeremy Carr, Tuvan throat singer Soriah, master percussionist Randy Odell, the list goes on and on. 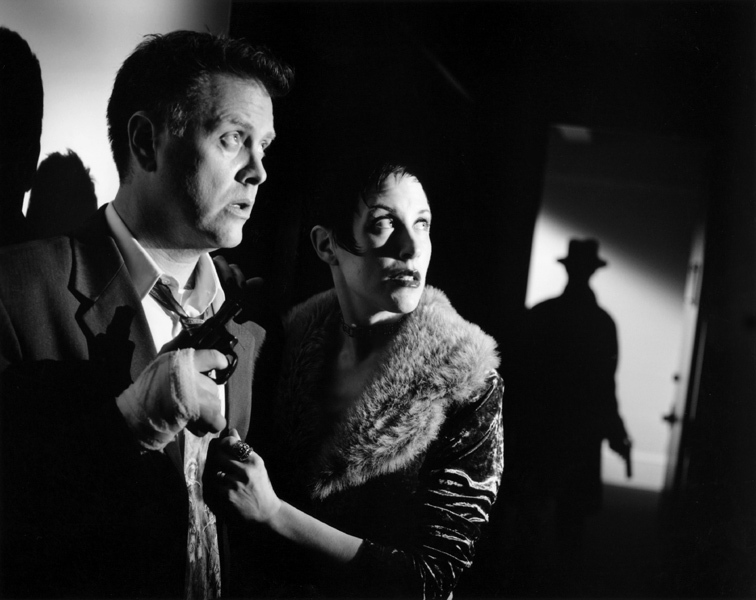 Some of my favorite collaborative moments: When famed author Lemony Snicket (Daniel Handler) and I performed a concert as a piano/accordion duo to celebrate the 100th anniversary of Fantômas, the beloved French pulp “Lord of Terror.” We played our hilarious, spine-tingling version of the original “Ballad of Fantômas” with all 26 verses! I got to share the stage with legendary Doors’ keyboardist Ray Manzarek while we played keyboards, and discussed how literature influenced our music. I acted in several seasons of classic Grand Guignol with renowned troupe Thrillpeddlers—dying onstage in all sorts of violent ways: plunging off a balcony while singing Tosca, being hypnotized by a mad scientist, killed in a violent train crash, torn apart by a savage wolf boy! Allowing yourself to be terrified and scream onstage in front of an audience is profoundly liberating and cathartic. Diabolique: Your act is often described as dark cabaret, would you agree with the label, and what does the term mean to you? How would you describe your work within the context of “Gothic”? Tracy: All these terms are annoying. They negate the artist, to serve the marketing—and constantly spun around in a blender. We must now cram everything in watered-down boxes to sell it to the unknowing herd. The sad thing is this hyper-branding ruins the impact, the poignancy, the meaning of a piece of art on its own terms. To merely slap it with a label is ignoring it. But hey, this is about business, not art, they tell you. Hello Internet. That’s why, sadly, art has less meaning in people’s lives. When I was growing up, that’s how you bonded with someone. (Certainly if you were an outlier.) What bands do you listen to? What books are you reading? What are your favorite films? Now, it’s what phone do you have? What apps? How many Facebook friends do you have? Tech has become the barometer. This constant commodification is ruining culture in general. It’s ruined so much of what music is, and what impact it had on your life. Music was expression. It could be dangerous, subversive, it STOOD for something. If you saw someone from across the room with a Gang of 4 t-shirt, you knew they were a kindred spirit. There would be that constant, crazed search for your favorite band photos, t-shirt or buttons in the back of magazines, or at an obscure record store. You had to put effort into the quest! It meant something! Now it’s pointless stock at at Hot Topic or Target. I saw a guy in LA recently wearing a Nirvana t-shirt. I asked him about Kurt Cobain, he said he did not know who that was. I’ve read comments on my own music videos that say “I really like this music, but don’t know what this style is called, it’s so unique, so I’m not sure if I can like it or not.” How sad we now need PERMISSION to think for ourselves. Be brave enough to form your own opinions! To create whatever you wish to create. If anything, that is my message, the entire point of my career: Embrace your strange, live your life brazenly and unapologetically. Honor your distinct vision amidst the struggle, the stupidity, the naysayers, and the corporate brainwashing. There has never been a more vital time to escape the cage. Diabolique: Tell us about some of the ways in which your music has made it into film and television. Tracy: My first major placement was an NBC-TV newsmagazine segment about absinthe (late 1990s when it was still illegal and taboo.) They used my music, with Erik Satie, plus Nine Inch Nails and Marilyn Manson while you saw visuals of Oscar Wilde, Baudelaire, and Van Gogh cutting off his ear in an absinthe stupor! (laughs.) I felt like I had arrived in grand company. My songs and instrumentals have been in several independent and feature films. I did the end title song for Jeremy Carr’s brilliant new thriller Other Madnesses, which has won several awards. Plus— PBS, the CBS hit show Navy NCIS featured my songs as themes for sultry goth forensic scientist Abby Sciuto (Pauley Perrette.) And Showtime used my track “Evil Night Together” as the Final Symphony—the ad campaign to promote the wildly-anticipated final season of Dexter. I would love to do more scores and songs for film/TV. Diabolique: Where do you find inspiration? For me, it’s more of a sensory response to the immediate; a word or phrase, an image, a story, a mood, a fragrance, textures, colors, the allure of the unknown, the forbidden, anything that enables me to ‘slip into the cracks” and get out of this world for a while. It’s the grand escape hatch. And even though I’m holding the reins, I never know where it will take me. I simply trust that I can hold on with all my might, and see it through to the other side. That’s the place where all songs live. Diabolique: So far what would you consider your biggest achievement? Tracy: One of my greatest pleasures of late has been immersing myself alone in unusual locations, or a place with a strange story, and composing music as a reaction to that environment. The intense purity and immediacy is so exciting. You are hearing my raw emotional response at the piano. I’ve found myself conjuring the hidden score in decrepit gardens and cemeteries, on the antique Steinways of the (supposedly haunted) Victoria B.C. 1890 Craigdarroch Castle, an 1800s San Francisco medical asylum, abandoned buildings inside the famed 1776 Presidio military base, and the Los Angeles mansion of a 19th century murderer. The lovely and difficult thing about this work is that I can’t prepare for it, as I never know what to expect. I must allow myself to be completely vulnerable; simply feel, and react. It’s not about me anymore; it’s about the music, the story. It becomes so much bigger than any of us. 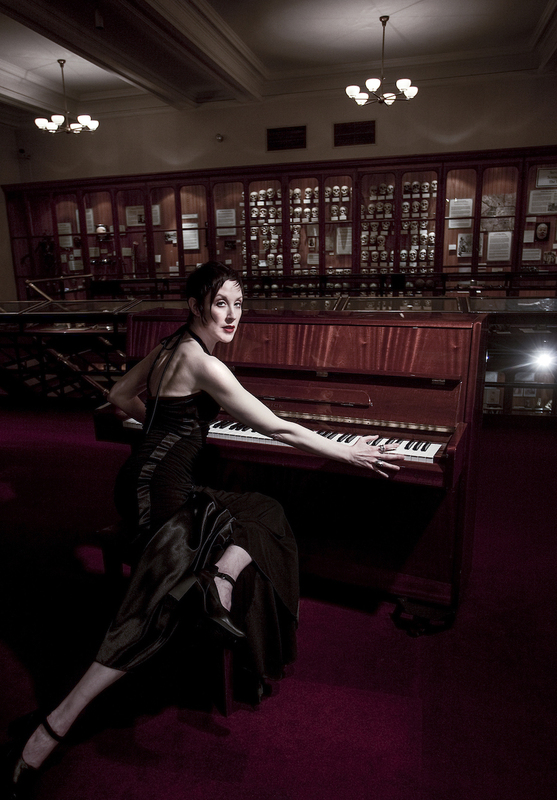 My huge dream-come-true is that I am first musician in history to ever be awarded a grant from Philadelphia’s famed Mütter Museum, to create a series of work inspired by its spellbinding collection of medical oddities. I spent nights alone at a piano amidst the Mütter’s grotesque cabinet of curiosities, which includes the death cast and conjoined liver of original Siamese twins Chang and Eng, the skeleton of the Harry Eastlack “the Ossified Man,” Einstein’s brain, The American Giant, books bound in human skin, and the Mermaid Baby. It was vital for me to be in the presence of these long-lost souls, as I composed and recorded. They become an actual part of the work and not just the subject matter. I began this project in 2012, with subsequent visits, and have become totally caught up in the research! What began as a single music album, has transformed into the idea of a full-blown book/memoir project with music and visuals. Excited to finally get back to it. Diabolique: If you could work with anyone past and present, who would it be? Tracy: I’d love to have jammed with Led Zeppelin’s drummer John Bonham. Actually Jimmy Page (guitar) and John Paul Jones (bass) are all such phenomenal musicians, I would adore the opportunity to play with them. As well as the members of Pink Floyd. What a dream to be in the studio with David Gilmour! I would love to have Thom Yorke and Nigel Godrich (Radiohead) produce an album with me, and create that huge, heartbreaking soar of gloom and elegance. I wish I could have sung a duet with David Bowie. I have not recovered from my sadness and depression over his death. Diabolique: Where can we follow you on social media? This interview with Jill Tracy appeared on HorrorAddicts.net August 2016. HA: Do you write your own lyrics/where does your inspiration come from? JT: Yes, I write both the lyrics and music. Although the music always comes first for me. That’s the “way in.” The vocal melody will reveal itself early on, then words begin to emerge. I am a meticulous wordsmith to a fault. Some songs lay frozen in notebooks for years because I was never happy with one particular line. But then the perfect line may come to me, pop in my head, at a random time. The process of letting it go will often bring it back to you. As far as what inspires—it’s never any one thing specifically; that’s the beauty of it, the sheer randomness. It’s more of a sensory response to the immediate; a word or phrase, an image, a story, a mood, a fragrance, textures, colors, the allure of the unknown, the forbidden, anything that enables me to ‘slip into the cracks.’ It’s a process of being alive in that place, allowing the flame. My music is like a portal, a transport into another realm. When I write, I’m conjuring a magic place, getting out of this world for a while. It’s the grand escape hatch. HA: What singers or bands inspired you growing up? JT: As far as bands go—most definitely Pink Floyd. They captured that cinematic mood, that dark, mournful beautiful devastation that transported you completely. Also Led Zeppelin, The Cure, David Bowie, T. Rex, early Elton John, The Doors, Japan, later period Talk Talk, The Pretenders, Gang of 4, Psychedelic Furs, The Cult, Roxy Music, The Who, early Peter Gabriel, old Moody Blues, early Aerosmith and Black Sabbath, ahhh, so many! It was only after I began performing live that I became acquainted with more of the classical composers, oddly enough because I was always getting compared to them. My very first-ever review in the 1990s (Bay Guardian) described me as “Erik Satie meets The Cure.” And later it was a fan who compared my mysticism to Alexander Scriabin. I am forever honored that my work is resonating with people in that realm. HA: When did you first know you wanted to be a musician and how did you start out? JT: I have always been drawn to the mysterious— fantastical, otherworldly imagery. Worlds sans-time. I was obsessed with Alfred Hitchcock, Bernard Herrmann, Ray Bradbury, Rod Serling, Jean Cocteau. As a child, I tried to build a time machine in my bedroom closet. I thought one could travel through the shadows. I just wanted to live in those worlds. There was something atrocious, yet reverent about this thing. It kept calling me. I knew nothing about the instrument, but I kept venturing next door, poised on the golden bench for hours, letting thoughts and spectres rush through my fingertips, as it transported me far away. I didn’t know what I was doing– but didn’t want to do anything else. This became my portal. It still is. To this day, I don’t read or write music, it’s all intuited. HA: Can you tell us about your Musical Seance work? JT: I’ve learned to channel music spontaneously via various energy sources, whether found objects, environments, etc. The Musical Séance is a live travelling show, my long-time collaboration with violinist Paul Mercer. It’s a collective summoning driven by beloved objects the audience brings with them. Items of personal significance—such as a photo, talisman, jewelry, toy. This is a very crucial part of manifesting the music. Every object holds its story, its spirit— energy, resonance, impressions from anyone who has ever held the object, to the experiences and emotions passed through it. These compositions are delicate living things. They materialize, transport, and in the same second— they vanish. That’s the amazing thing about The Musical Seance— you never know what to expect, and each experience is entirely different, extremely emotional, for us, as well as the audience. It creates this rare synergy with everyone in the entire room. But one thing I’ve learned is––everyone in the world has a story to tell that will break your heart. JT: It literally translates in “clear-hearing.” As with clairvoyance, which means “clear-vision,” being clairaudient means the ability to hear things not of this world. I have always heard strange unexplained music. Often heavy and harsh, but compellingly exquisite, alluring, complex. I can’t even begin to describe it! It maddens me that there is no way that I could ever harness it to compose or record. It’s beyond anyone’s grasp. For the past few years, I have begun to hear people’s voices talking, it’s usually very urgent and fast, like they need to relay a message. I do believe in simultaneous realms, and that we have the ability to share a frequency, be an antenna, if sometimes only for a second. It’s a mingling of Time. I’m learning more about harnessing this gift, it plays such a key role in my ability to find hidden musical scores when I compose in unusual locales. I used to be leary of it, but now find it strangely comforting. HA: What non-musical things inspire your music? Is there a place where you go to be inspired? JT: It’s really about finding the quiet, so I can be fully receptive, like an antenna as I mentioned before. The Soul lives in the silence. You must be able to tune out to to truly tune in. Unfortunately, these days of on-demand, constant world-at-our-fingertips connection has destroyed our sense of mystery and childlike wonder. That breaks my heart. Monsters, marvels, lore, and legend—these are the things that make us feel most alive. Now there is so much constant NOISE—we think it enriches us, adds something, but really it is soul-stifling. We’ve lost our own identities inside the din. The Internet is a blessing and a curse. The ease to obtain information and connect with the world is glorious. But at the same time it’s destroying our individuality. Everyone is getting their news/views from the same sources and absurd algorithms, not looking outside, or challenging themselves to think further. We’re trapped in a giant echo chamber. There has never been a greater need to venture outside the cage, to seize our truth and authenticity. To be an individual now takes a great deal of effort. But so vital! HA: What’s been your favorite achievement so far? JT: My life’s work is about honoring the mystery…One of my greatest pleasures of late has been immersing myself alone in unusual locations, or a place with a strange story, and composing music as a reaction to that environment. The intense purity and immediacy is so exciting. You are hearing my raw emotional response at the piano. I’ve found myself conjuring the hidden score in decrepit gardens and cemeteries, on the antique Steinways of the (supposedly haunted) Victoria B.C. 1890 Craigdarroch Castle, an abandoned 1800s San Francisco medical asylum, and the Los Angeles mansion of a 19th century murderer. My huge dream-come-true is that I am first musician in history to ever be awarded a grant from Philadelphia’s famed Mütter Museum, to create a series of work inspired by its spellbinding collection of medical oddities. I spent nights alone at a piano amidst the Mütter’s grotesque cabinet of curiosities, which includes the death cast and conjoined liver of original Siamese twins Chang and Eng, the skeleton of the Harry Eastlack “the Ossified Man,” Einstein’s brain, The American Giant, books bound in human skin, and the Mermaid Baby. It was vital for me to be in the presence of these long-lost souls, as I composed and recorded. They become an actual part of the work and not just the subject matter. The project will include not only a music album based on the Mütter collection, but also an art book and memoir of my chilling experiences inside the museum after dark. All of my work will be factual. I’m done extensive research at the museum, even utilizing excerpts from letters and doctors’ records. I began this project in 2012, and have become completely swept up in the research! HA: What was the scariest night of your life? JT: This is a great question! People always ask me if I got scared inside the Mütter Museum alone in the dark, or if I get frightened when channeling music in a cemetery, asylum, etc. The answer is no. I am completely immersed in that moment— it is a feeling of hyper-realism. Being fully alive. Super-charged. It’s that same feeling when I’ve acted in classic Grand Guignol plays (famed Paris Horror Theatre 1897-1962.) Letting yourself be completely terrified onstage is a strange, exhilarating catharsis. Screaming at the top of your lungs in front of an audience is profoundly liberating. I’ve died onstage in many bizarre ways: Torn apart by a savage wolf boy, killed in a violent train crash, leapt off a balcony to my death, hypnotized by a mad scientist, locked in a castle tower with a demon, etc— The underlying thing is you know in your soul, underneath the fake blood and the layers of prosthetics and costumes, that you are going to be okay. BUT—I have been in some quite scary REAL-LIFE situations. I was in a near plane crash, as the airplane’s brakes went out. We had to prepare for an emergency landing on a foam-covered runway, hoping to slow down the plane. We had to remove all jewelry, belts, sharp objects, hold a pillow over our head, eyes closed, as we bent over our lap awaiting possible impact. I remember passengers screaming and sobbing. I was also mugged at knifepoint in a New York City subway alone at night. I instinctively ran after the mugger shouting within the empty concrete labyrinth. As I rounded a corner, he grabbed me. I was almost kidnapped in Paris by a strange man with pink hair and his two accomplices who locked me in the back room of a restaurant. I have discovered 3 dead bodies in my lifetime, in 3 different situations. In the midst of this real terror, your brain locks into that fight or flight mode— no time to feel afraid, you just do what you need to to think clearly and get through it! HA: What are your favorite horror movies? Eyes Without A Face (1960), The Birds (1963), Rosemary’s Baby (1968)—also Mia Farrow in the great lesser-known thriller The Haunting of Julia (1977), Invasion of the Body Snatchers (original 1956), Mad Love (with Peter Lorre 1935), The Sentinel (1977), The Shining (1980). HA: What are you working on now? JT: I’m currently writing — resuming work on the Mütter Museum book and music project, as well as other new songs. I just began a lovely hibernation from live gigs to focus on creating again. I am also designing what will be a subscription-only series called The Noctuary (inspired by my love and lore of the Night,) which will feature exclusive music, videos, stories, private concerts, behind-the-scenes interviews, and more for subscribers only. I am excited to reveal the details! Please sign up to my inner email circle at JILLTRACY.com and you’ll be first to be invited to join The Noctuary! HA: What is available now that the listeners can download or buy? JT: I have 5 full length albums, plus various film scores, and singles, even a Christmas album— my dark classical interpretation of some of the more haunting old carols. Definitely the holiday collection for people who prefer The Dark Season. As an intro to my work, I would start with albums The Bittersweet Constrain and Diabolical Streak. HA: What is the website they can find it on? I offer some exclusive titles on my site unavailable on iTunes, Amazon, and other corporate shops. Plus no middlemen taking money for nothing. HA: What is the best social media site for listeners to connect with you? At what point in your life did you begin to manifest your artistic visions? JT: My mother tells the story of me at 3 years old, unplugging the long retractable cord of the tank vacuum cleaner to use as a microphone. I knew at a young age I didn’t want the conventional life of marriage and family. And like most artistic souls, I always felt out-of-step with the ”normal” world, a misfit, looking for directions from elsewhere. I would lecture to my stuffed animals about time travel and the solar system (as much as a seven year old could fathom such things.) All I wanted to do was to discover or manifest hidden worlds. I transformed my bedroom closet into a make-shift Time Machine, adorned with my favorite zebra lamp and a tiny wooden chair. I sat in the darkness and felt strangely relieved and inspired. There was something atrocious, yet reverent about this thing. It kept calling me. I knew nothing about the instrument, but I kept venturing next door, poised on the golden bench for hours, letting thoughts and spectres rush through my fingertips, as it transported me far away. I didn’t know what I was doing– but didn’t want to do anything else. This became my portal. It still is. What experiences have been most emboldening and/or encouraging to you along the way? JT: At first, it was anything but encouraging. The industry constantly told me (and still tells me to this day) that my work is “too unique, dark, and sophisticated” to ever have an audience. But the best thing I ever did was not to listen to any of them. They were wrong. But, I realized I couldn’t go in the front door, not even the back door–so I built TRAP doors—I went directly to my audience. My great fans have been the most encouraging thing in my life. For the uninitiated, how would you describe your elegant netherworld of work? My music is indeed dark, but devastatingly beautiful. It was recently described as “musical morphine.” I rather like that. I am the mistress of aural opiates. 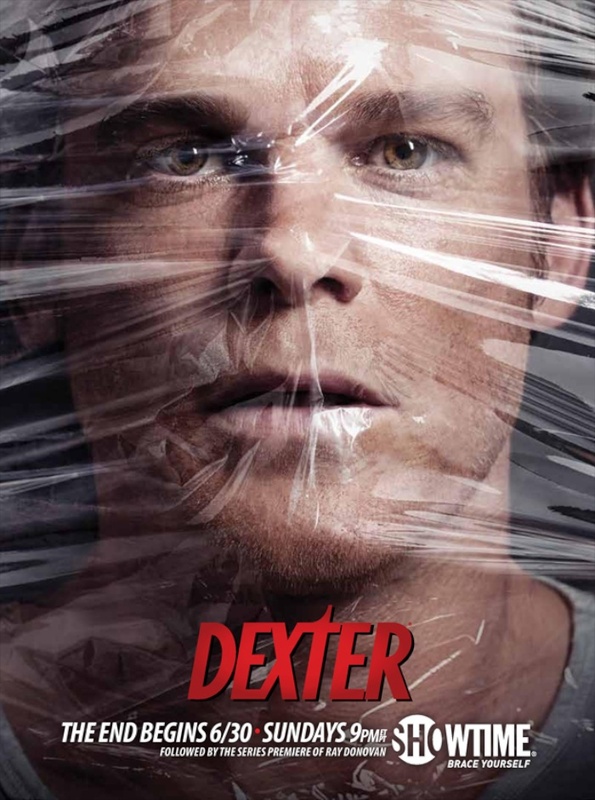 Your song, Evil Night Together, was selected by Showtime Networks to promote the final season of hit show Dexter. What do you think made it such a good fit, and is this the first time your music has been featured on television? JT: It’s been a tremendous honor and a thrill to be Dexter’s “Demonic Requiem.” Showtime used my music in a trailer called “The Final Symphony,” highlighting the darkest, alluring, and bloodiest moments from the last seven seasons. It’s brilliant. It fits like a severed hand in glove! With such a dramatic and cinematic quality, would you like to see your music in more film and television? How has film influenced your work? JT: Absolutely. My work is all essentially a score— of the Mind’s Eye. I strive to be a gatekeeper to emotions. That’s the magic music allows —like a trap door or portal, it accompanies us—to a place we never knew existed, but wish to go. One of my greatest pleasures right now is immersing myself in unusual locations laden with mysterious history, and manifesting music from my reaction to the environment. The intensity and immediacy is fascinating. I call it “spontaneous musical combustion” (as homage to “spontaneous human combustion,” and my affinity for peculiar history and science tales.) I’ve found myself conjuring the hidden score inside haunted castles, abandoned asylums, decrepit mansions, gardens, and graveyards..
As a child, when I discovered the classic horror/film noir composers— Bernard Herrmann’s scores to Alfred Hitchcock films, “The Day the Earth Stood Still,” Franz Waxman, Hans J. Salter, among others —it was a watershed moment. I realized that the MUSIC completely dictated the emotion of whatever you were watching. It was utterly subliminal, primal. I wanted to figure out how to conjure dark and enchanting imaginary worlds of my own. Not to mention the dreamlike, mysterious, sensual look to those films. I just wanted to live in those worlds. I still do. You’ve also got some new music and film projects? JT: My song “Pulling Your Insides Out” was used as the end title in director Jeremy Carr’s award-winning surreal thriller Ice Cream Ants. (I also star in the film as the evil seductress Mona!) To accompany the film’s new director’s cut, we have just released a new music video for the song. I also recorded a new song “The Colour of the Flame,” commissioned by Swedish publishing company Malört, to accompany their upcoming book, an homage to 19th century Polish writer/occultist Stanislaw Przybyszewski’s gorgeously terrifying tales. The song will be released on a limited edition collectible 7″ vinyl to accompany the book, alongside a new track by Blixa Bargeld (Nick Cave and the Bad Seeds/ Einstürzende Neubauten) and Stephen O’Malley (Sunn O)))). David J (Bauhaus/ Love and Rockets) asked me to create a dark classical piano version of his iconic song “Bela Lugosi’s Dead.” We’ve been in the studio currently resurrecting this glorious vampire. Stay tuned! (Since this interview was published, the David J/Jill Tracy dark classical piano version of Bela Lugosi’s Dead has been released!) You can listen and download it HERE. You’ve recently made history as the first musician to be given a grant by Philadelphia’s legendary Mutter Museum— for a project we’re dying to hear all about – what can we expect to see and hear, and how did this lovely venture come about? 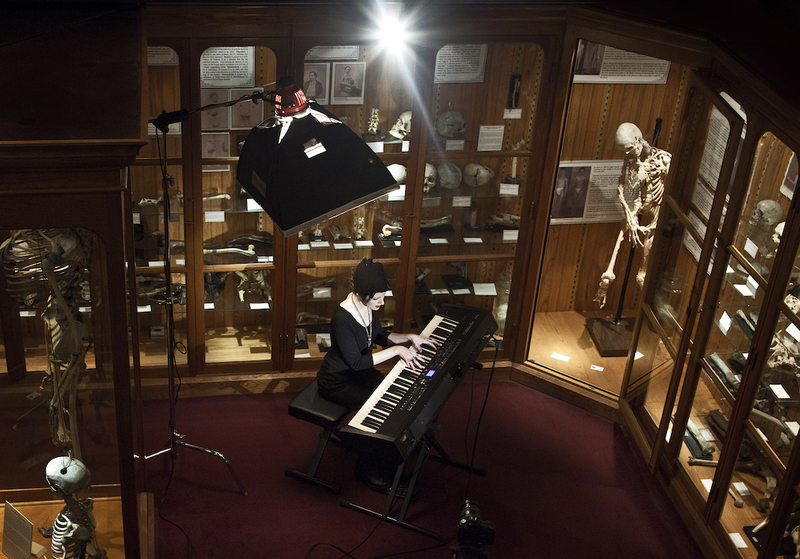 JT: Yes, I’m the first musician to be awarded a grant which is enabling me to compose music inside the Mütter Museum, a series of compositions directly inspired by pieces in the collection. It was vital for me to be in the presence of these long-lost souls, as I composed. I needed to immerse myself in their world and make them a real part of the creation. This is my gift to them. I spent nights amidst the Mütter’s spellbinding collection of curiosities, which includes the death cast and conjoined liver of original Siamese twins Chang and Eng, the skeleton of Harry Eastlack— the Ossified Man, Einstein’s brain, the Mermaid Baby. and the Hyrtl Skull Collection. The project will include not only a music album based on the Mütter collection, but also an art book, film, and memoir of my chilling experiences inside the museum after dark. ***This interview archived from Gothic Beauty Magazine Issue 41. Order a back issue HERE. The Kickstarter is ON! Click HERE to go to the main campaign page and show your support and grab some rewards. We need your help to finish this project! The campaign will only run until August 22, so act now if you’d like to be involved. I can’t tell you how honored I am to work again with brilliant filmmaker Jeremy Carr, plus bring to life one of the favorite songs I have ever written. This video has already been shot, so this campaign is to enable Jeremy to edit, complete all post-production and digital transfer necessary. After winning several film festival awards and accolades, Ice Cream Ants is slated to be released to the public for the first time with a new director’s cut. “Pulling Your Insides Out” is the end title song to the film, so Jeremy thought it befitting to create a new music video to coincide with its online release. “Pulling Your Insides Out” has always been my favorite song on my album Diabolical Streak. In fact, that album has been getting quite the resurgence lately as Showtime Networks chose the track “Evil Night Together” as the campaign song promoting the wildly anticipated final season of Dexter. So as they say— “everything old is new again.” It’s been thrilling for me to re-inhabit “Pulling Your Insides Out” and (with your kindness) unveil the beautifully eerie video it always deserved. Find out lots more, and choose your rewards on the main Jill Tracy Kickstarter page.